It's a children's choir so it's supposed to sound like angels. Someone said that. It might me an old concept and world-view but it's got some truth and this group did sound like angels, perfectly intoned, soaring pitches, gently managed dynamics. 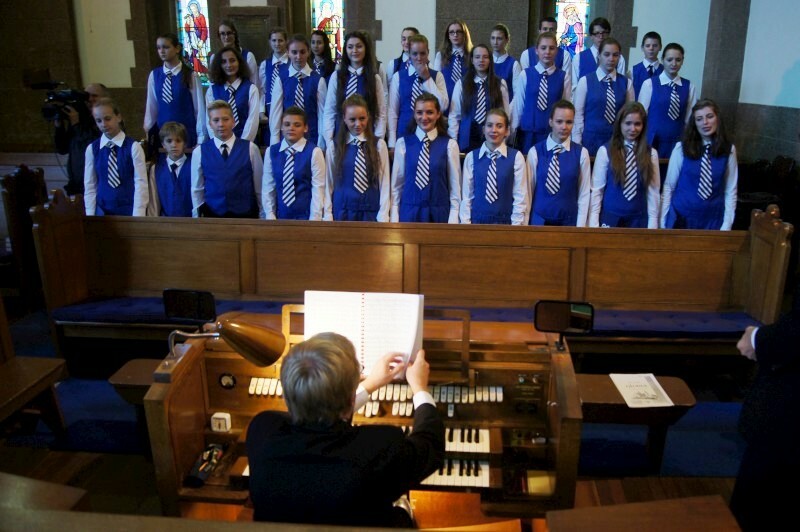 This was the Czech Philharmonic Children's Choir. I'm not sure how I knew they were playing, but OI heard of the gig and it intrigued me. It's one benefit of having an embassy in your town. The turnout was decent. The concert was free. The location was St Andrew's, Forest, the unfinished but impressive church facing Parliament House and Capital Hill on the Manuka side. With these perfect performers, I realised how good were the acoustics. And the decent organ and available piano. But of course the stars were the children. They were mostly girls with just a few boys. A string of sopranos out front that would hit the most pure of notes. The harmonies mostly sweet, but moving into twentieth century and chromatics for one or two songs. The words mostly of praise, religious, from the mass, often in latin. 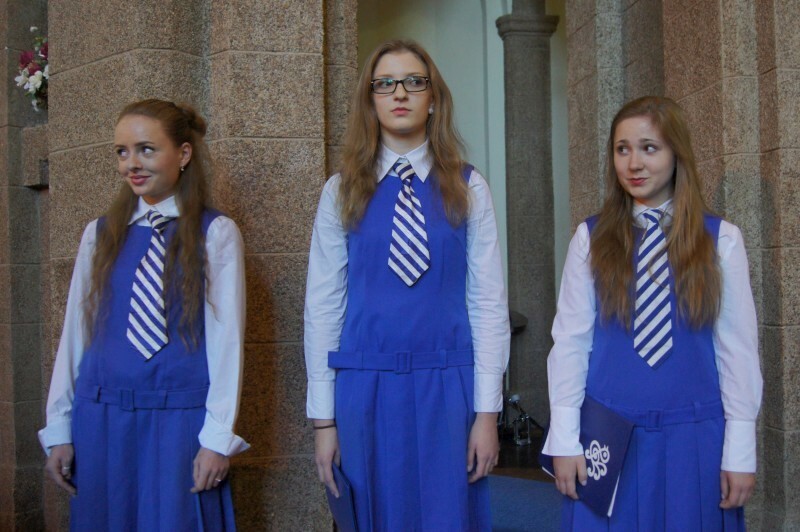 Just a few popular numbers, a Ukrainian folk tune and a Czeck moutain song (Hoj, hura hoj! = O Mountain, O!) 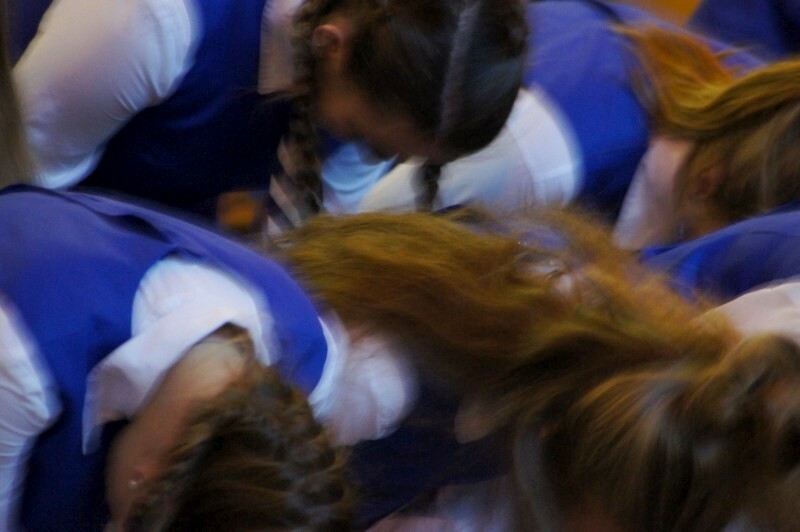 One song had three girls moving out of the choir and standing just in front of us, perhaps 2 metres away, and the clarity of voices and the precision of their harmony was breathtaking, to be accompanied by the choir and organ. 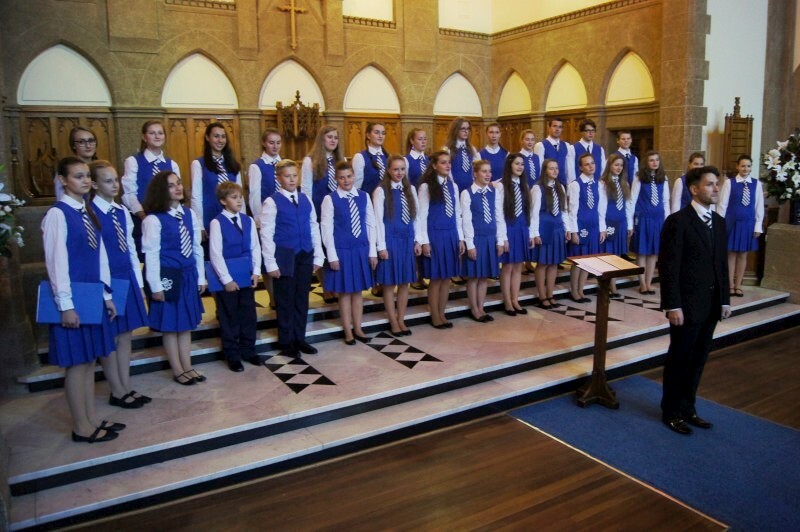 Petr Louzensky, the choirmaster, told me after that this group wins all the competitions it enters. I'd believe it. 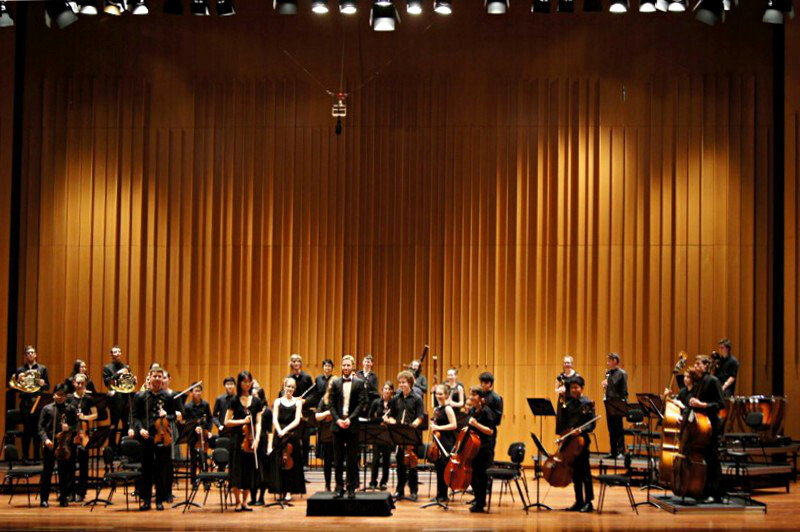 They have performed at La Scala, Carnegie Hall, Moscow Conservatoire; they have toured five continents. 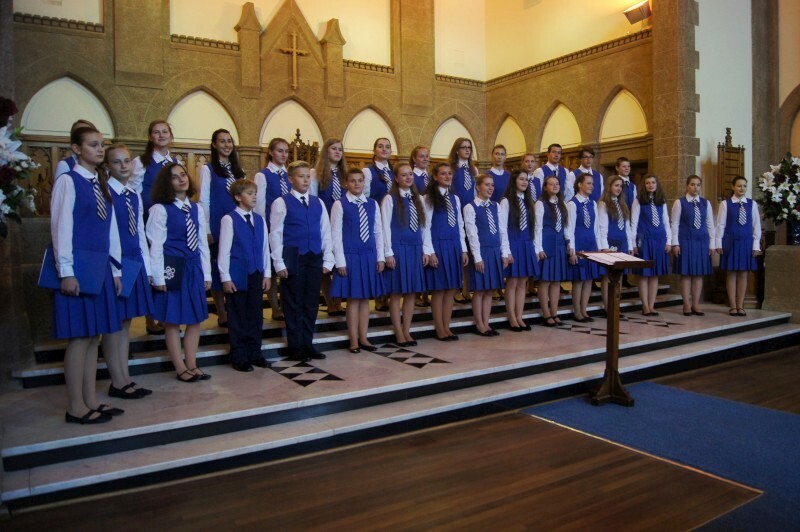 They perform around Prague, in various concert halls, the National Theatre, with the Czech Philharmonic and the National Opera and more and as a bigger choir and have recorded over 50 CDs. And have done for some time: they were established in 1923. Fabulous discovery. 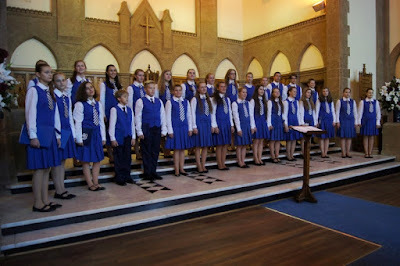 The Czech Philharmonic Children's Choir performed at St Andrew's Forrest. 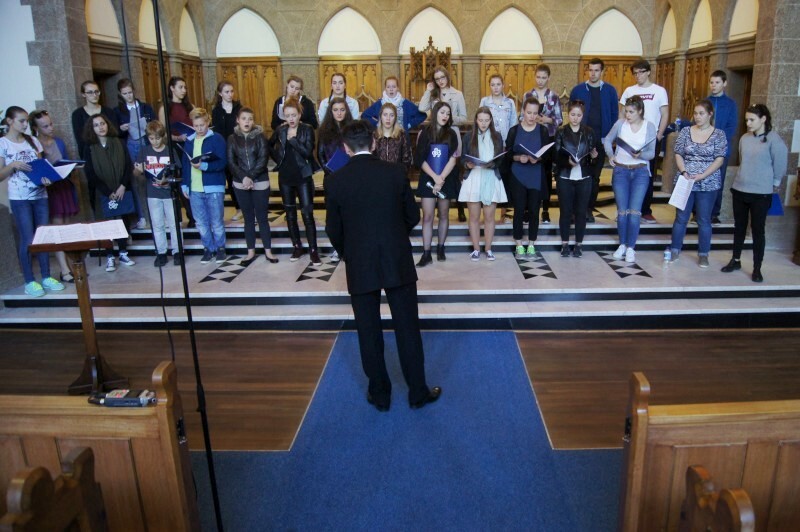 They were led by Petr Louzensky (choirmaster) and accompanied by Jan Kalfus (piano, organ). I don't get there often enough, but I did get to the Wayne Kelly trio gig and jam session at the Old Canberra Inn this last Tuesday. It wasn't hugely busy but it is a Tuesday night and there were tables of people chatting and meeting and enjoying some fabulous playing. I missed Mitch Preston and John Black and Leo Joseph and Angela Lount jamming. I got up for a few tunes to play with Wayne and Alec Brinsmead, whose playing I'd just admired that afternoon at Ainslie Arts Centre. That was fun. We played Alone together, Caravan and Blue Monk. Wayne took some considerable deviations in, I think, Caravan, so we had some odd harmonies to resolve out of. This is the sort of thing I love. I heard of a tour to Adelaide and country towns along the way being planned by Leo and Key Grip. Sounds like much fun. Also of a new residency (Sat nights, 7-9.30, Tilley's) by Wayne's trio. He'll be playing a genuine grand piano there, so worth some frequent visits. And in such a civilised and well fed location, too: it suits them. Also, chats about school, New Orleans, wedding bands, Christopher Pyne (...). Nice; keep it up; attend! Wayne Kelly (piano) played with Ben O'Loghlin (bass) and Mark Sutton (drums). Jammers included Alec Brinsmead (drums) and Eric Pozza (bass). It's a fling back to a comfy past to hear Hugo Lee's band playing funky 16ths-note patterns. This is '70s funk as I remember it, before a descent into its pop-disco incarnation (which was itself entertaining enough if lighter and perhaps less pretentious). I haven't heard that same insistent bass, the odd rhythms, the infectious moves for ages. I was trying to transcribe a rhythm as I listened and realised how difficult it can be. It all fell out when I counted in 8 rather than 4: it was the odd leading 16th notes that caught me out. So the bass was key; interestingly Jack on a 6-string Ibanez for some funky solos, too. Then over this, a melody from Hugo's alto and calm, at times almost meditative, but sharp, snappy drums and edgy guitar chords that would sometimes move to solo with unassuming swirling effects, perhaps accompanied by another of the '70s innovations, an EWI, a synth controlled by wind and sax-like keys but sounding, this time, all the world like an organ. All a throwback in some ways, but satisfying and brought to date by current-gen players. Not just that. There were two originals by Hugo, one rock solid, one another funk outing. And a few standards. Ladybird done quickly but otherwise straightforwardly, and Caravan rearranged for time and hits and double-time walks. And a Kenny Garrett (as we were reminded, not Kenny G) tune to end. I enjoyed it all, grooved with the 16th notes, expecially drooled over the superbly neat and apt drums. Another great little lunchtime outing at the Ainslie Arts Centre. 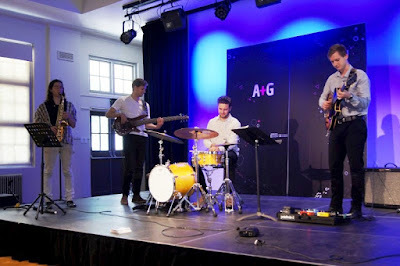 Hugo Lee (alto, EWI) led his band with Ben Forte (guitar), Jack Schwenke (bass) and Alec Brinsmead (drums) at the Ainslie Arts Centre. They really are coming thick and fast now. National Capital Orchestra performed at the Albert Hall under Lizzy Collier and it was a wonderful concert. I was particularly interested. The main work of the day was Dvorak New world symphony and I'd played it only a month or so before with Maruki. I felt this was more restrained, but maybe that was only my impression. Bars always seem to fly by when you are reading them! The concert started with Grieg's Peer Gynt suite, the moody morning and gentle movements and the boisterous and very loud Hall of the mountain king. From the first, this was played with lustrous, clear, relaxed, intoned harmony, for a feeling of immense luxury. Then a similar piece, Rachmaninoff Prince Rostislav, tonally spelling out a story of a chain mailed soldier drowning while pining for wife and companions and a storm that arouses him and a final fall into death with caressing water nymphs (not all bad!). 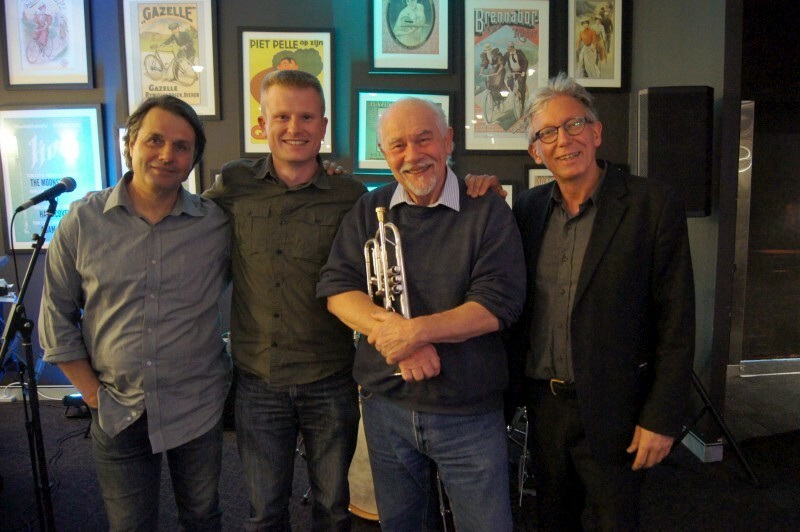 Several trumpets and a drum performed a fanfare by Riedl to draw the audience back to their seats. It was in the program, but presented unexpected but invitingly. Then the New world. All lovely and something that I enjoyed with the experience of having played it before. Nicely done, supremely confident, perhaps slower than our take. 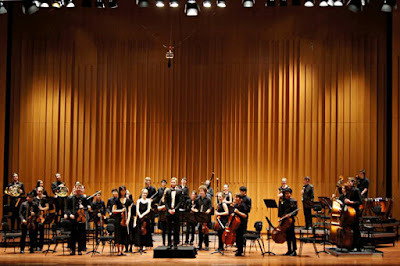 In all, a wonderfully capable concert from a very capable orchestra. 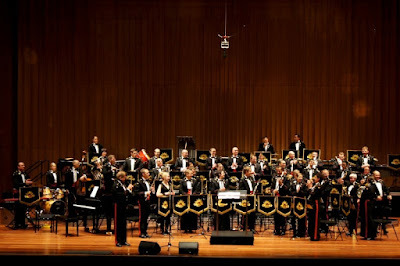 They claim the mantle of Canberra's other orchestra (after the CSO, of course) and I dare say it's deserved. A great pleasure. National Capital Orchestra performed at the Albert Hall under Lizzy Collier (conductor). It was so bad we could at least have a laugh after the concert. 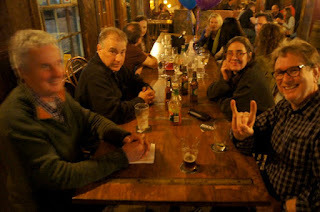 I won't say who, or what, but we attended a dismally terrible concert recently. It was a solo performer playing Bach and other (that's not much of a giveaway: everyone plays Bach). I could see this person had experience behind him. 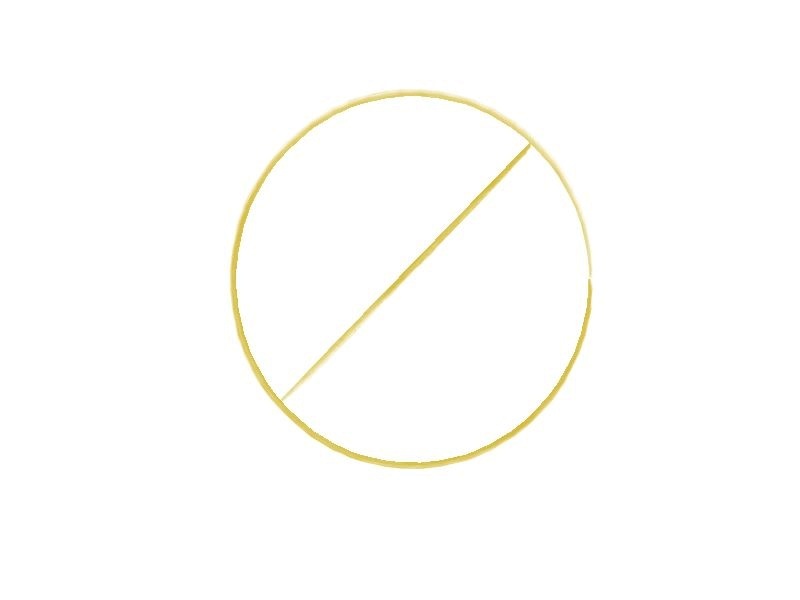 But how careless! There were errors every bar or so, a rhythm you just couldn't follow even in something as regular as Bach, stops and apologies and frequent repeats. 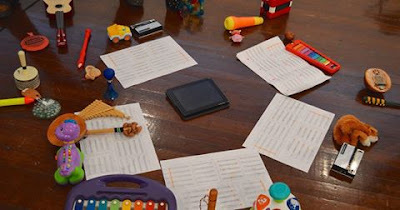 It reminded me a practice session, but for someone needing considerable work with a metronome. At least playing with others makes you keep to rhythms and structure. It was long, an endurance test. I wondered if he'd been unwell in some way, that he'd perform so badly. It was being recorded and I wondered if the recording would actually end up on radio. The interval was interesting: not a jot from anyone about the performance. Only after did our trio comment negatively, over a wine. And we remained a respectful audience. 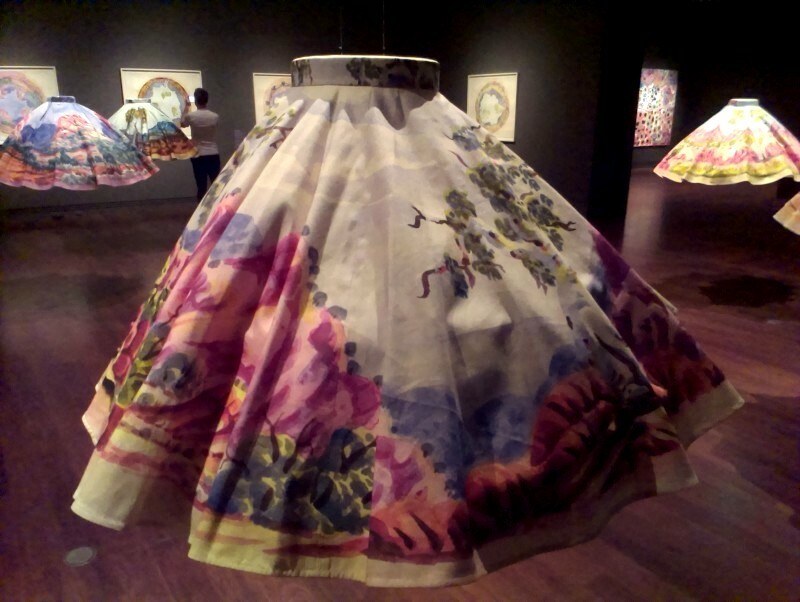 We clapped when each piece ended, if not with rapture. But there were more serious coughing fits than normal. Perhaps we should have demanded our money back (it wasn't a cheapie, especially for a one-man show) or better, it should have been volunteered, but we are too meek a culture for that. Thinking now, I wonder if the performer's had problems recently to explain such a gig. Now I worry about his state of health. It's all a strange and revealing outcome. Maybe more memorable than many competent concerts, in truth. Best that it remains an anonymous memory. Back to Llewellyn for another great pleasure. I hadn't heard the Canberra Youth Orchestra before but I'd played with some of their members and I was impressed. CYO have a good reputation and this concert just confirmed it in my book. The first piece was Strauss Die Fiedermaus Overture and it started with such precision that I was relieved when just a little imprecise intonation appeared later. They were heavenly in those first notes and then at least became human. But all through, the music was done with admirable poise and maturity. Leonard Weiss was conducting as the new Musical Director. He leads with a great sense of dynamics and guidance and the orchestra worked well with him. He's only 23 or so, so this is a genuine youth orchestra, although mature beyond its years. Then Nimrod from Elgar and an odd thing, a bassoon concerto, by Weber, played very nicely by Matthew Ventura. Then, after interval, Mendelssohn Symphony no.3 op.56, his Scottish symphony. This was not an easy play and they did it with panache. I groaned in sympathy with the basses for some long lines of semiquavers in the final movement. They played it all or, at the very least, covered like professionals. That's how things are in this playing. So I left with considerable joy and exhilaration and huge respect. 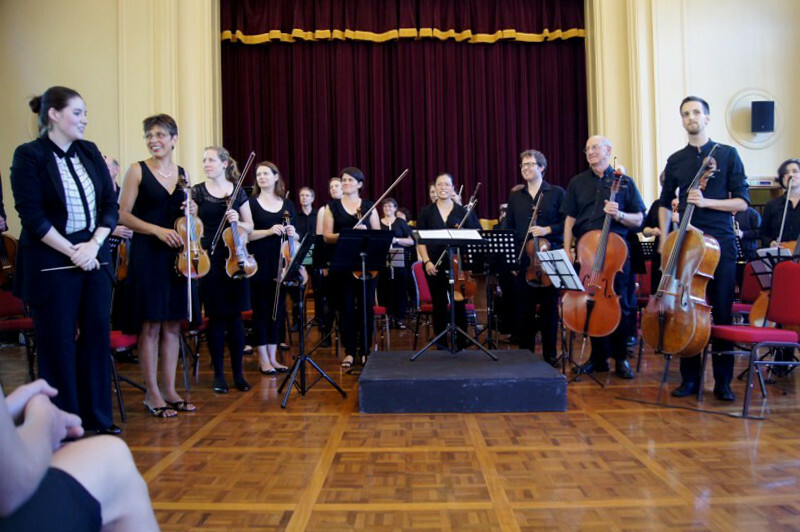 The national version, the Australian Youth Orchestra, will be here at Llewellyn for its summer camp and free concerts in January and I expect a few of these players will be on stage. It all bodes well for music in Australia even if they have to leave Canberra for further study. So, the eternal question, "what's the matter with kids these days?". In my book, nothing: the kids couldn't be looking better. 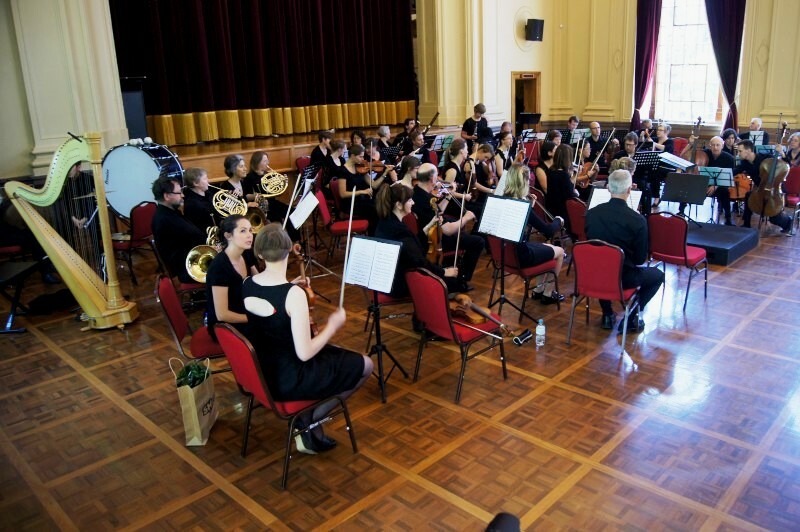 The Canberra Youth Orchestra (CYO) was led by Leonard Weiss (conductor) at Llewellyn Hall. Matthew Ventura (bassoon) performed the solo in the Weber Bassoon Concerto. How unexpected was this and what a great pleasure. I've seen the Duntroon band but this was different. The other times, they were around 20 players, big band style, popular music. Always competent if an odd sight in their uniforms. But a pleasure. This, today, was the full band: symphonic in extent and in complexity and repertoire. But a wind ensemble, so no strings other than one lone double bass (Barnaby Briggs looking decidedly more military than in his other incarnations). It was obvious from the first glance at the program: Puccini, Grainer, Grieg, Bernstein, and two lesser recognised, Sheldon and Tosti. Tosti and Puccini were operatic with a soprano up front. Another proof of this outfit's flexibility. (Apparently Fiona Wilkins, soprano, had been singing rock and pop to 2am a few days before). The Sheldon was busy and rhythmic with layered melodies and changing bar lengths. The Puccini was the lovely O mio babbino caro from Gianni Schicchi. How lovely is that? The Grainger was his Colonial song. The Grieg was his piano concerto A minor, no less (just the first movement). And the peak, for me, one of my faves of the musical genre, Bernstein Symphonic dances from West Side Story. Just fabulous and exciting and tear-jerking. Three different conductors. One soprano singer. 40 other musos. Three tubas; lots of clarinets. It's fun to identify players you know from the jazz scene: Baba, Barney, Julian. Others? But how unexpected. They are playing a few gigs next week but in the more light vein. Just another take on the Army band. The Band of the Royal Military College, Duntroon, performed at Llewellyn Hall. 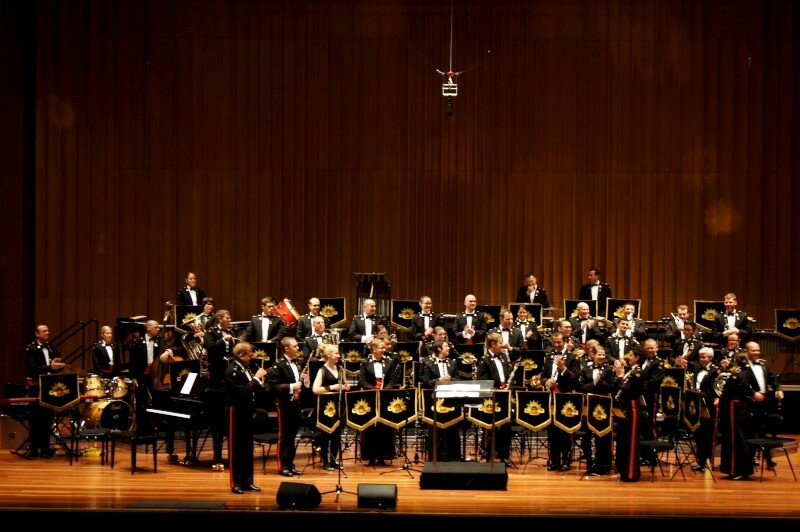 Conductors were Andrea McMahon, David Bird and Matthew O'Keeffe. 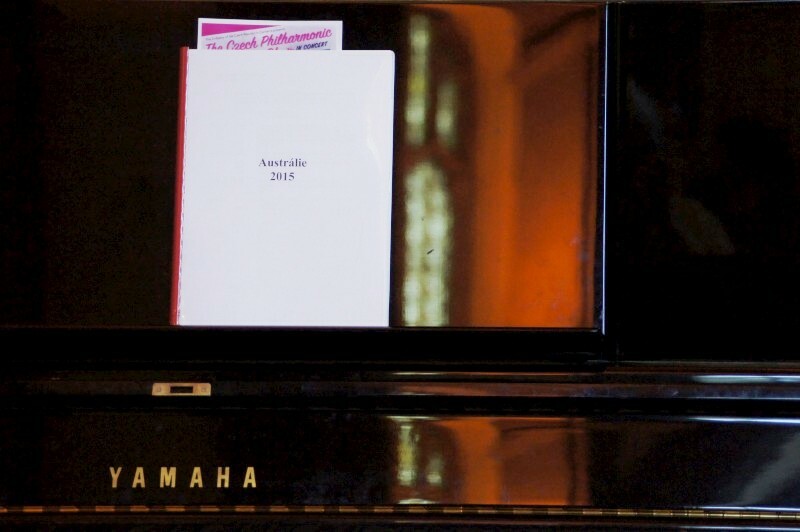 Soloists were Fiona Wilkins (soprano voice) and Sean Henderson (piano). Politics in the Pub and the Australia Institute now seems to be the right audience for the Greens, given Labor's small targets and indecisions. So it was that this PitP was on the fourth floor, a larger room used when the RSVPs are many. 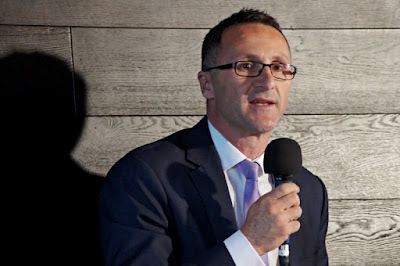 I guess many wanted to see Richard Di Natale, this new Greens leader, in the flesh. He seems a likeable, sensible, concerned, undogmatic type on teev and he has a history as a doctor with conscience so that fits. In the end, I felt very comfortable with his simple and surprisingly centrist presentation: recognising science, economics, the "real world" that's not one of finance and slogans and ideology. Away from the myths of the "lifters" (who do money while the "leaners" actually do work) and the entitled failures who fob off to a comfy bolt hole in Washington DC. But I digress. 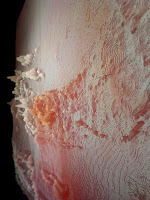 We were introduced to Richard then he spoke broadly of issues. Health is a function of many things. The economy is just a means to an end, but is important for important ends. 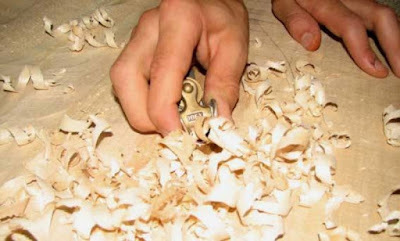 An economy is just a tool. A transition to a future Australia, of innovation, intellect, education and the rest. How Turnbull was received with a sigh of relief now must prove himself different. but he's started will. How he needs a plan to manage climate change and transition. How climate is the greatest market fialure (quoting Stern) and of the benefits of acting now (we've lost benefits of acting earlier and Abbott even threw benefits away). How after Trudeau, Australia's position will be "nothing short of embarrassing" at Paris. Of some good news of transition (Geelong, and more). Of coal's structural decline and Adani and Liverpool Plains and the battle of past and present that was Abbott. Of the successes of ARENA and CEFC. Of growth but also distribution. Of expenditures, eg, on medicine, as choices of a rich community, esp given our comparison with the US's privatised health (National health expenditures: Aust 9% of GDP; US 17% of GDP; the American option can be nothing but ideological given these figures). Of intelligent policy: in military expenditure (Trudeau's first action as to cancel Canada's JSF purchase); in taxation (fix tax avoidance, then consider GST). Then some questions. Placing the economy more prominently is a deliberate choice to disabuse notions of Green incompetence; Greens consider the purpose of economic measures, for the Government it's an article of faith. Greens support free education and education as a priority, but recognise this is a longer term goal. But it's essential for Australia's future. He was asked about Labor's policy and responded "what is it?". Renewable energy is popular. There's a history of bad decisions in Defence: a debate is necessary, but things can change quickly. Labor and Greens may work together, but coalition is not an option and some Labor members see Greens as a threat. Automation of jobs will require structural change and government must support people in transition. Someone asked about expenditure on health in final years of life. Di Natale responded that the medical profession needs to deal much better with its own failure here (interesting and sensible response). Then marriage equality (why not a free vote) and budget surpluses vs investment in infrastructure when interest rates are low. Privacy and metadata retention, interestingly from an ex-Communist country resident (oh, Labor supported that; shame on Labor; I've written my email to Shorten on that one). Di Natale: "if you have it, you'll use it" and "we share your concerns". (Good on Greens; I've got my VPN but it costs and so will the extra charges from our ISPs for keeping all this metadata). I liked this man. He seemed informed, even and balanced, concerned about issues that matter and prepared to question some dictums, eg, that economics is all and defence can't be questioned. Richard Di Natale spoke at Politics in the Pub for the Australia Institute. There were a few thoughts going through my mind as I heard Belle Whyte and her band at Ainslie Arts Centre. About the anthem. Our current national anthem, Advance Australia Fair, is a bore and Deborah Cheetham turned down singing it at the AFL grand final because of the lyrics (specifically, "for we are young and free”: fair enough given Aboriginal Australia is deep time). But Belle suggested My island home as an alternative but it doesn't do it for me. Also, about the Music School and what musics it now develops. But I must say I liked this gig. Belle has a nice strong voice and a jovial presence. The band was serious and sounded good. They played some nice covers that I could reminisce over and some originals that were new to me, so obviously lacking that recognition. The themes were love and friendship so expected, from youth and pop. The chords were pretty simple but grooves were steady and subtle. That's just how this is and should be: engaging and foot tapping. Belle did a great take of Valerie by Amy Winehouse. It's a corker. Also some sweet songs that took me back: Perhaps perhaps perhaps which must always remind me of Coupling for all future time and that infectious Ronette's tune, Be my baby. I missed the harmonies and horns in that one but Belle did a great job of it. Is this the modern School of Music? I think it is. Not jazz, not classics, but entertaining and nicely done. I enjoyed it. 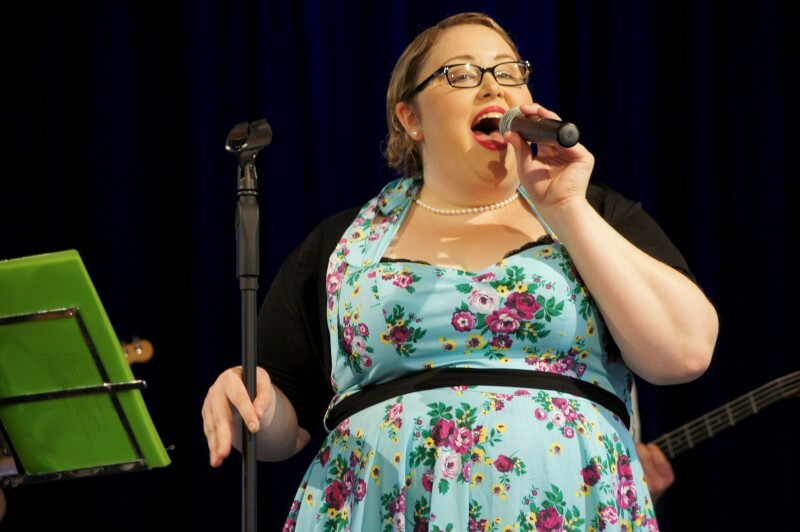 Belle Whyte (vocals) led a quintet with Robbie Mann (piano), Heti Blaazer-Gross (guitar), Brendan Keller-Tuberg (bass) and Hayden Fritzlaff (drums) at the Ainslie Arts Centre. 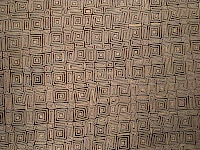 I've only visited from afar, but I enjoy seeing the flowering of Aboriginal art. 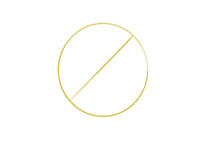 It's so much more than dot paintings, as valid and impressive an expression they may be. What I've seen of contemporary Aboriginal art is often ardently political, retains a link to traditions and the land, may be confronting or gentle and open. 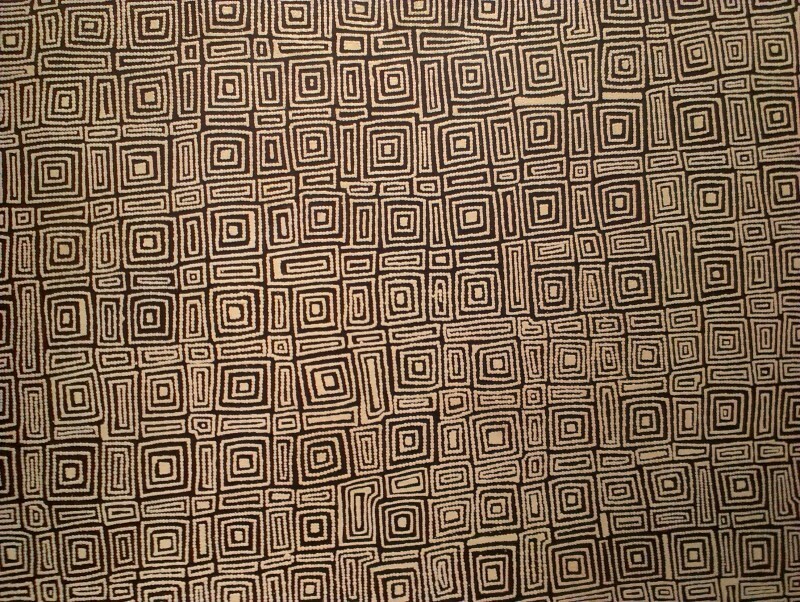 I went off in Adelaide to view some such art mounted in numerous locations for the Tarnanthi festival of contemporary ATSI art. Our outings were just a visit, none too serious but enlightening. Tandanya, the Aboriginals-owned and managed multi-arts centre was mounting a new exhibition, so no luck there. 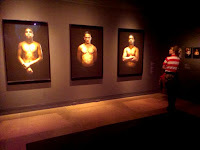 The Contemporary Arts Centre of SA (CACSA) was displaying two little exhibitions. Fiona Foley dealt with opium's role in subjugating Aboriginals in Queensland. 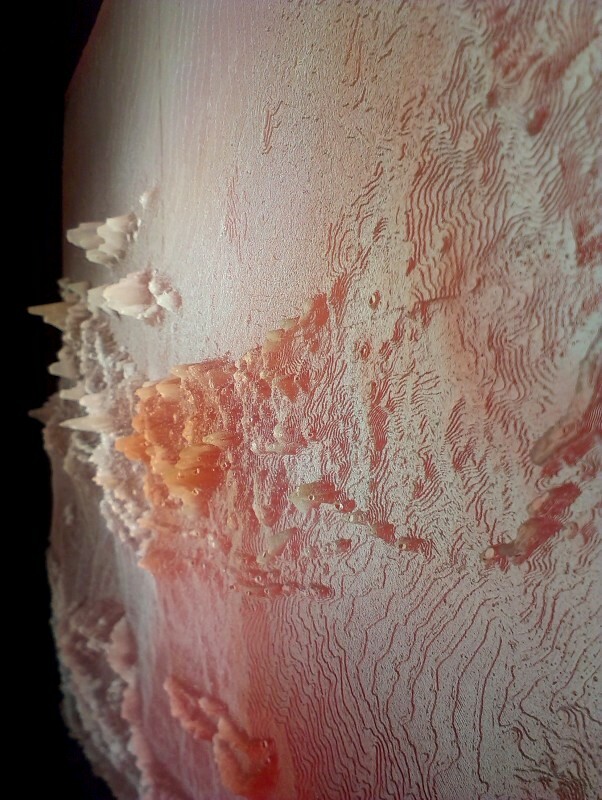 Brad Larkin presented 3D printed maps of Alice Springs and thereabouts. 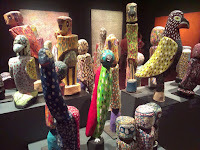 The Art Gallery of SA is a favourite location of mine. 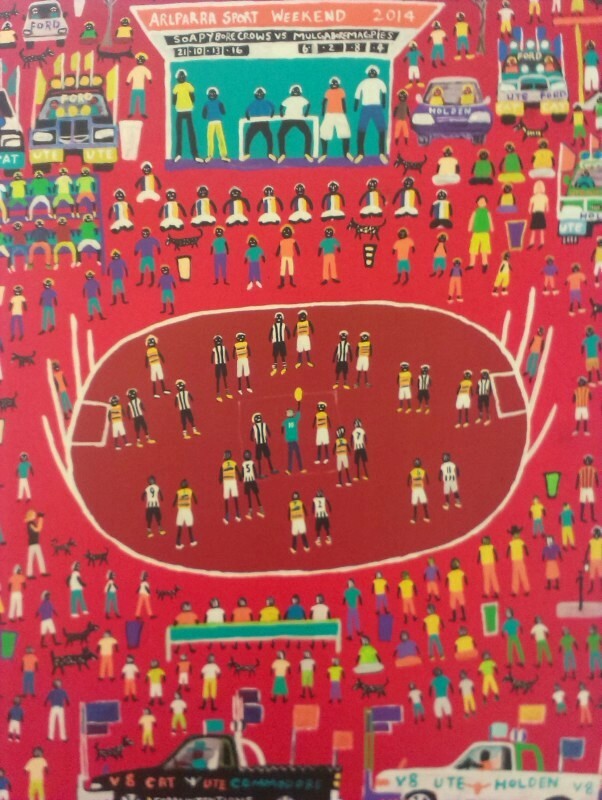 Dinni Kunoth Kamarre and Josie Kunoth Penyarre displayed arrestingly joyful pictures of Bush footy (Aussie Rules) painted with child-like innocence. 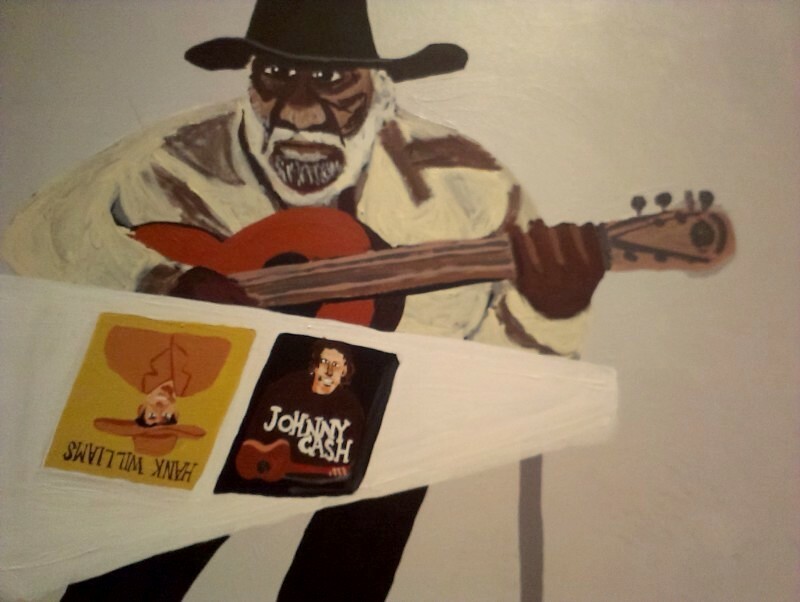 Vincent Namatjira had some lovely personalities, including Jimmy Pompey playing guitar. There were Namatjira-influenced hand-painted round paintings (or skirts or lamp shades) and bush birds in painted timber and a set of rabidly political photos from Tony Albert of 20 black men standing bare-chested with red targets painted on their chests. All fascinating and a rejoinder to a too-Euro experience. 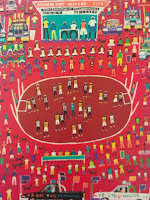 Tarnanthi is a festival of contemporary ATSI art in 22 venues across Adelaide, with exhibitions running to January 2016. 2015 is the inaugural festival. They say no news is good news. That seems to be the case with the ANU School of Music. The changes happened in 2012 and it's still in the news. And it's not good news. 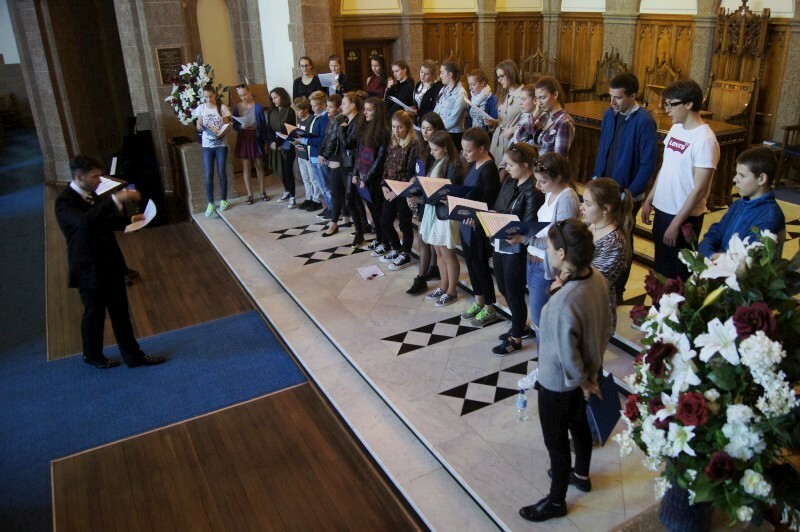 A few weeks back it was the departure of Head of School Peter Tregear. He'd valiantly tried to rebuild but departed recently for London. Note, London: he's no unrecognised slouch. Then letters to editors and meetings of students. We read the other day in the Canberra Times that another slew is to leave, not least Erin Helyard and Johannes Luebbers. Both highly regarded; both significant performance artists. See below for links to articles about this history (not a comprehensive list). They tell me the background to these moves is not quite as dire as suggested by CT, but I do long for some good news for a change. On a sad note, this is CJBlog post no. 1500. I like to visit bass shops - no secret there. I was in Adelaide for family matters and I got out to Belair to meet Peter McLaughlin of BassWorks. I had little time to spare for this hilly drive and a chat with this informed bassist and a drool in this room of basses. The website claims over 100 basses in stock (and some cellos): there were ~15 basses in the office, including his McLachlan (Quenoil model) inspired by Francois Rabbath's instrument. It's something special to be surrounded by instruments of such bulk and earthy colour and musicality. A pleasure. Peter McLaughlin is the head of BassWorks Australia, a small family business dealing with double basses and other stringed instruments. BassWorks is located in Belair in the Adelaide Hills. Why this fascination with Italy? It's long been so. 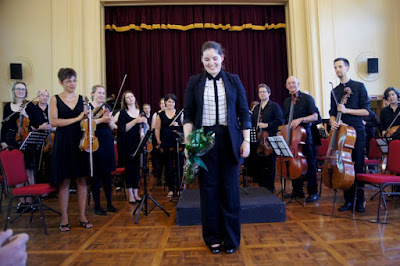 Ellen Falconer played Italian impressionism from the 20th Century - Della Piccola, Resphigi and Malipieri. Ellen spoke of Respighi interpreting renaissance music that she then played with a 21st century perspective. Layer on layers of interpretation but Italian music at heart. Interesting. I enjoyed the Respighi but was more entranced by the unpredictable and more modern Della Piccola with his odd times, dissonance, alternating hands, unexpected intervals. He wrote just on the cusp of WW1 and the unsettled era is evident. Respighi was more predictable; not unexpected given the Renaissance source. Big, full consonant, attractive, dignified. I'm not sure I recognised the 21st century influences but it's inevitable in the hands of a current musician. But my favourite was the final work by Malipieri, three preludes, with their roiling arpeggios and romantic dynamics and pauses, nicely appreciable and easy to partake of. Ellen did a great job of introducing some unexpected and presumably little known works and composers. Great to see. This Out to lunch series promotes new and experimental music as well as classical music less performed. This was a perfect fit. 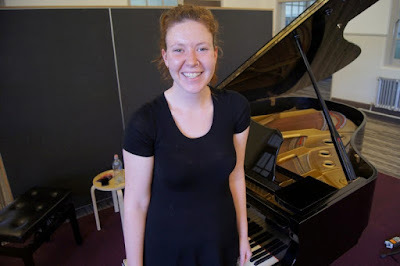 Ellen Falconer (piano) played Della Piccola, Resphigi and Malipieri at the Out to Lunch series at the Ainslie Arts Centre. Jazz is a great way to travel. In any decent city, there's a findable public venue with like minds and a certain openness. Musos can sit in - improv and a common repertoire supports this; listeners can listen and chat. It's welcoming. Tilt played a gig at the Tradies again and we had a sit-in. Inigo Kilborn, long-time performer in London and now France, is visiting family in Canberra. He had his cornet (little, but effective instrument that it is) and we were a quartet for a few standards, what, Stella, Alone together, Autumn leaves, Beatrice. What a lovely, clear, precise sound; nicely improvised, intelligently controlled and lyrical; nothing showy but musically wonderfully effective. Thanks, Inigo, much enjoyed. Inigo Kilborn (cornet) sat in with Tilt at the Dickson Tradies. 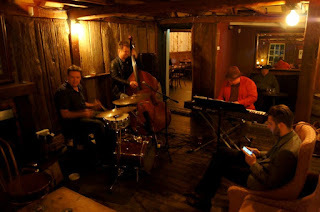 Tilt comprised James Woodman (piano), Eric Pozza (bass) and Dave McDade (drums). Mingus and (Joni) Mitchell. Both greats of their fields and friends who wrote for each other and recorded together. 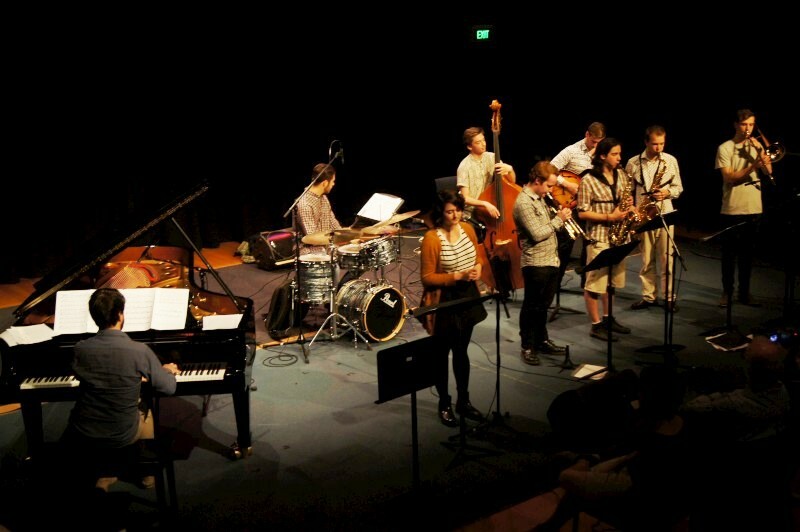 The ANU Jazz Collective presented a concert to give due recognition to these two. They played a series of tunes from each and two originals influenced by them. Rhythm section, four horns, vocals. The Mingus tunes: Haitian fight song, Fable of Faubus, Goodbye pork pie hat; the Joni Mitchell songs: River, Both sides now, and the lyrics she added to Mingus' Goodbye pork pie hat; the two originals, Collective jazz by Brendan Keller-Tuberg and Fields by Andree Thompson. I could easily feel the relationship to Mingus in Brendan's composition given the switches to double time, the bass features and drum hits and collective improv and blues melodies. Brendan did a good take on Mingus throughout in his playing, too. Fields was more open, odd timed, perhaps more Joni-contemplative. I loved the ensemble sound of the four horns throughout: trumpet, trombone, tenor and alto saxes: nicely intoned and some decent solos. Rose Costi took the vocal role and did the Joni songs with considerable panache and involvement. One listener reported tears (Both sides now, I think) and another said she was close to it. I didn't quite feel this, and I was uncomfortable with the slow pace on River, but the singing was very impressive. I could not but love a concert dedicated to these two masters: bluesy, earthy and true. A great pleasure. The ANU Jazz Collective presented a program called Mingus meets Joni at the Band Room. 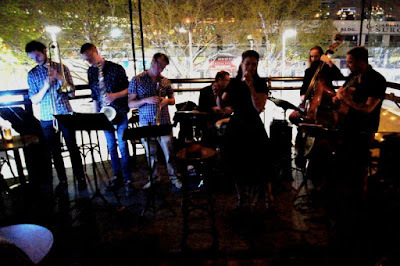 Performers were Rose Costi (vocals), Anthony Cotter (trumpet), Jack Schwenke (trombone), Hugo Lee (alto), Andre Thompson (tenor), Ben Forte (guitar), Brendan Keller-Tuberg (bass), Alec Brinsmead (drums) and Johannes Luebbers (piano). I missed Kimba and Ryan Griffith when they were at Smiths a few months ago but not this time at Hippo. The venue suited them - lively, chatty, social. Her music fits: standards although often lesser known ones. She mentioned 1958 as a key year for her. We mulled over that: post bop, hard bop, cool, R&R, youth, good post-war years, LPs, stereo. It was a great era for jazz and US popular culture. Kimba was leading a local Canberra septet for the launch of her CD. Nothing lost here with this band! These were amongst the best in town and the playing was awesome. Mark and James played the steadiest of grooves but let go for solos when on offer or called for. The horns were great. Dan, Tom, Rob read with panache and laid down colour behind vocals. Rob's solos were steady and melodic; Dan's were ecstatic, shredded but with trad growls; Tom was big toned, lyrical but ready to explore outside. Ryan was on guitar (and accompanying vocals for one particularly intimate song), all clean and uneffected and melodious and occasionally chordal. Kimba herself was lively, playful, expressive, rounded and not too high pitched, communicative with the audience. I just caught the first set. The songs were various shades of swing, blues-boogaloo and one intimate song, presumably original, sounding more Australian authenticity than American wit. I liked it and warmed to the personal honesty, of love amongst disappearing charms of youth and a challenging society. "With divorce rates high / we must be bold / Let's stay together / till we grow old". The title was Sickness and in health. All lovely ensemble playing, effective charts and charming interaction. Kimba Griffith (vocals) led a septet to launch her new CD at Hippo, comprising Ryan Griffith (guitar, vocal), Dan McLean (trumpet), Tom Fell (tenor), Rob Lee (trombone), James Luke (bass) and Mark Sutton (drums). 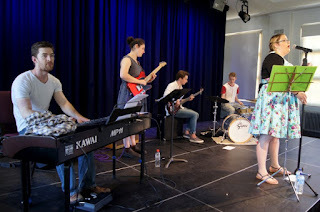 This was another in the lunchtime series featuring School of Music students, and perhaps friends, at the Ainslie Arts Centre. Gen Kinoshita, Eddie Huang and Matt Ventura played an unusual mix of oboe, bassoon and piano. Not common. I didn't catch the names of composers, except a Chopin etude played by Eddie on piano and a Bach partita from Gen on oboe. Otherwise, the performers mixed and matched various instruments, only playing one piece with all three instruments together. Matt mostly played bassoon, but also brought out a flute for a solo piece at one stage. But known or not, this was a capable and pleasant and unexpected mixed outing for too small an audience. Nice one. 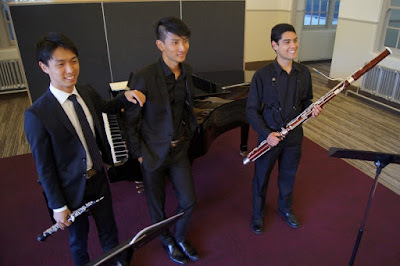 Gen Kinoshita (oboe), Eddie Huang (piano) and Matt Ventura (bassoon, flute) performed at the Ainslie Arts Centre.